Within the Knersvlakte, cyanobacteria occur hypolithically underneath translucent quartz stones in areas with quartz pavement and, outside pavement areas, they are soil-inhabiting within the uppermost millimeters of the soil. Both habitats were characterized in terms of biomass and growth patterns of cyanobacteria. Long-term microclimatic conditions were determined. Biomass of organisms within both habitats was determined by means of chlorophyll analyses. A transect approach was used to determine the frequency of hypolithic growth depending on the size, weight, and embedding depth of the quartz pebbles. Organisms were identified by means of microscopic analyses of the samples. Microclimatic conditions within both habitats, i.e., temperature, light intensity, air humidity, and soil moisture, were recorded bi-hourly from September 23, 2004 through September 7, 2006. The biomass of hypolithic and soil-inhabiting crusts was almost identical, 88 vs. 86 mg Chla/m2 and 136 vs. 134 mg Chla+b/m2. Within the quartz fields, 46.8% of the surface area was covered by quartz stones with 69% of translucent quartz stones colonized by hypolithic cyanobacteria and algae. Colonized quartz stones were significantly thicker, heavier, and more deeply embedded in the soil than uncolonized ones. Whereas the annual mean temperature on top of quartz stones was nearly identical to that underneath thin and thick quartz stones, daily temperature amplitudes were largest on the stone surface (up to 48.1K), compared to the hypolithic habitats (up to 39.4K). Light intensity in the hypolithic habitat was between 15 and 30% of the ambient light intensity during daytime. Water condensation in the absence of rain occurred during 50% of the nights on the quartz stone surface, but only during 34% of the nights on the soil surface during winter months within 1 year. Soil moisture beneath quartz layers was greater and less variable than beneath soil-inhabiting crusts. In spite of the large differences in the microclimatic conditions, both habitats seem to be similarly well suited for cyanobacterial growth, resulting in equal biomass values but some differences in taxonomic composition. Biological soil crusts (BSC) are well known to occur in hot and cold deserts and semi-deserts throughout the world. They comprise cyanobacteria, algae, lichens, and bryophytes as well as bacteria and fungi in variable proportions growing within the uppermost millimeters of the soil (Belnap et al. 2003). Based on the successionally most advanced organism group present, they are coarsely defined as cyanobacteria-, lichen-, and bryophyte-dominated soil crusts (Büdel et al. 2009). In addition to these more general types of soil-inhabiting crusts, Büdel et al. (2009) define two additional types of BSC for southern Africa: the Namib lichen fields, which are restricted to this fog desert environment, and the hypolithic crusts. The latter are mostly dominated by cyanobacteria, often accompanied by green algae, diatoms, fungi, and bacteria (Cameron 1960; Cameron and Blank 1967; Friedmann et al. 1967; Friedmann and Galun 1974; Broady 1981; Rummrich et al. 1989; Büdel and Wessels 1991; Schlesinger et al. 2003; Galun and Garty 2003; Ullmann and Büdel 2003; Cockell and Stokes 2004; Bhatnagar and Bhatnagar 2005). Lichens (Büdel and Schultz 2003), bryophytes (Müller 2009; Cowan et al. 2010), and even red-colored chloroflexi bacteria (Lacap et al. 2011) have also been reported to form the dominant organism group on the bottoms and sides of stones which are tightly embedded into the substrate. Hypolithic growth has been recorded on the soil-embedded sides and underneath quartz (e.g., Vogel 1955; Pointing et al. 2007; Schlesinger et al. 2003), limestone (Friedmann et al. 1967), dolomite (Cockell and Stokes 2006), marble (Cowan et al. 2010), flint stone (Friedmann et al. 1967; Berner and Evenari 1978), prehnite and agate (Tracy et al. 2010), and even calcareous material of organic origin such as bivalve shells and recently dead snails (Friedmann et al. 1967), all of which are somewhat translucent, allowing enough light to reach the niche-inhabiting organisms. The hypolithic habitat is known to be characterized by different ecological conditions compared to those occurring on the soil surface, i.e., it experiences lower intensities of overall light and UV radiation (Vogel 1955; Berner and Evenari 1978; Schlesinger et al. 2003; Cowan et al. 2010), buffered thermal conditions (Broady 1981; Warren-Rhodes et al. 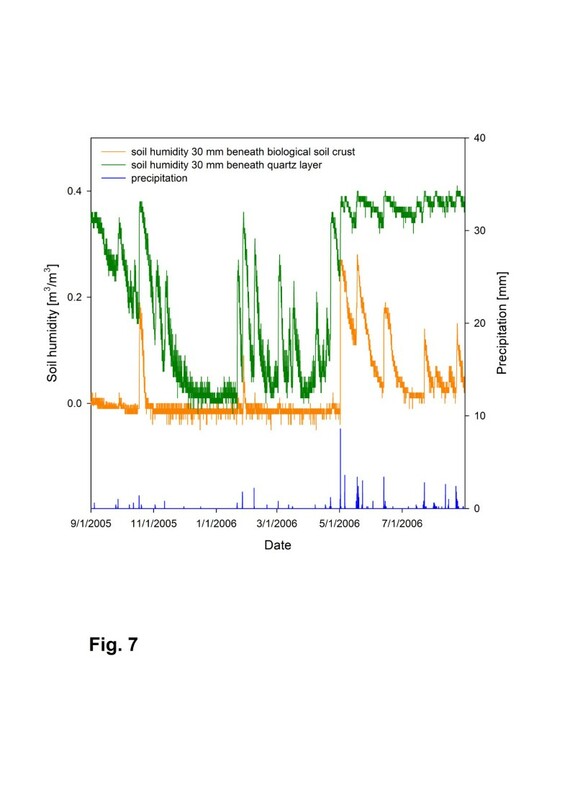 2006), and enhanced moisture availability compared to the surrounding soil (Warren-Rhodes et al. 2006). In contrast to that, Schlesinger et al. (2003) also observed lower light and improved water conditions, but higher temperature amplitudes and absolute temperature values and described that as a modest greenhouse effect for the hypolithic community of the Mojave Desert. At our study site in the Knersvlakte, we observed widely developed hypolithic growth of cyanobacterial organisms (Figure 1A, C; Weber et al. 2010), but also well-developed cyanobacteria-dominated soil-inhabiting BSC in regions without quartz stone coverage (Figure 1B, D). In order to analyze the utilization of both ecological niches by cyanobacteria and algae, we identified cyanobacterial genera of major relevance and determined the biomass of photosynthetically active organisms by means of chlorophyll analyses. Utilization of the hypolithic habitat was characterized through quantification and measurement of hypolithic growth parameters. By means of long-term meso- and microclimate measurements, we analyzed and compared the conditions within both habitats. The effects of these microclimatic differences on long-term carbon fixation patterns are discussed herein. The Knersvlakte and its habitats for cryptogamic organisms. (A) Overview of the Knersvlakte with extended quartz fields and the characteristic flora, which comprises highly diverse succulent plants and dwarf shrubs. (B) Within the Knersvlakte, large tracts of quartz fields with hypolithic growth occur next to soil surfaces, facilitating epedaphic growth of biological soil crusts. (C) Quartz pebbles of the Knersvlakte with hypolithic cyanobacterial growth on the formerly embedded part of the quartz stone. (D) Cyanobacteria-dominated biological soil crusts occurring in quartz-free regions within the Knersvlakte. This study was conducted on the farm Goedehoop, next to the BIOTA South Observatory Goedehoop (No. 26) in the Van Rhynsdorp District, Western Cape Province, South Africa. The farm lies in a semiarid area known as the Knersvlakte, characterized by an extensive gently rolling gravely plain. The vegetation and other characteristics of the Knersvlakte have been reported by Cowling et al. (1999). Large tracts of the Knersvlakte are covered by a layer of quartz stones (Figure 1A), within which a distinct quartz field flora occurs (Schmiedel 2002). The importance of these quartz fields, which vary in size, was stressed by Schmiedel (2002), who pointed out that they represent a biodiversity hotspot with 150 taxa (species and subspecies), 121 (80.7%) of them being endemic and occurring obligatorily in quartz fields. The quartz fields are interspersed with locally confined distinct dwarf shrubbery. The Knersvlakte experiences cool winters and hot summers, with daily air temperatures that range from maximum values of 47.9°C in February to minimum values of 1.1°C in June (BIOTA meteorological station readings from 2001 to 2009; Jürgens et al. 2010). Although rainfall occurs throughout the year, the bulk of the annual rainfall occurs during the cool winter months (July–August), with smaller peaks occurring during April (autumn) and October (early summer). The mean total annual rainfall for the period of measurement at the BIOTA meteorological station at Ratelgat (31.283°S, 18.603°E, height 240 m a.s.l.) was 125.7 mm, ranging from 69.2 mm (in 2003) to 175.4 mm (in 2008). Detailed mesoclimatic conditions of the study site, which were measured by us, are described in the Results section. For determination of the most common genera of cyanobacteria, samples of soil-inhabiting crust (belonging to the following crust types: 1: light cyanobacterial crust, 2: well-established cyanobacterial crust, and 6: hypolithic crust; Büdel et al. 2009) were randomly collected in Petri dishes within the study area. Light microscopy was used to determine the soil crust material, based on Geitler (1932) and Komárek and Anagnostidis (1998, 2005). Chla+b[μg], Chla[μg] is the chlorophyll content of the sample in micrograms, E648, E665, E700 are the absorptions at the given wavelengths, and a is the amount of DMSO used in milliliters. The chlorophyll content per surface area was calculated by dividing the Chl value by the surface area of the sample. Chl contents of both habitats proved to be normally distributed, as checked by the Kolgomorov-Smirnov and Shapiro-Wilk tests. A T-test was used to analyze differences in Chl contents between the two habitats. North of the Goedehoop observatory (31.2750°S, 18.6003°W), the quartz stone coverage and size-dependent colonization were determined along a 300 m transect with 30 sampling points. At each sampling point, all pebbles along a 1 m line were collected, separated into stones with and without hypolithic growth, and packaged for later analysis in the laboratory. At each point a digital image of 1 m2 soil surface was taken for later analysis of quartz stone density. All colonized and uncolonized quartz stones per sampling point were counted, weighed, and their thickness and depth of embedding measured with a digital caliper. Irregularly shaped stones were measured at their thickest and widest points. Embedded depth was measured at the deepest point, thus determining the deepest possible point of colonization by hypoliths. A Kruskal-Wallis one-way analysis of variance on ranks (SigmaStat Ver. 3.1) was used to determine the significance of differences between the thickness, mass, and embedded depth of colonized and uncolonized quartz stones. Quartz stone density analysis was done by digital analysis of the 1 m2 images using Adobe Photoshop software. In a first step, all vascular plants with clear bounds (e.g., Agyroderma sp.) were masked and saved as an extra image. The remaining image was displayed with maximum contrast as a black and white image, the soil being shown in black and the pebbles in white. The coverage of each color was analyzed with ArcView 3.2 (ESRI Inc., Redlands, WA, USA) software and the Spatial Analyst application. All images were converted into grids, in which black pixels were assigned the value 0 and white ones the value 1. The number of pixels with each value was extracted from the attribute table and converted into percentages. 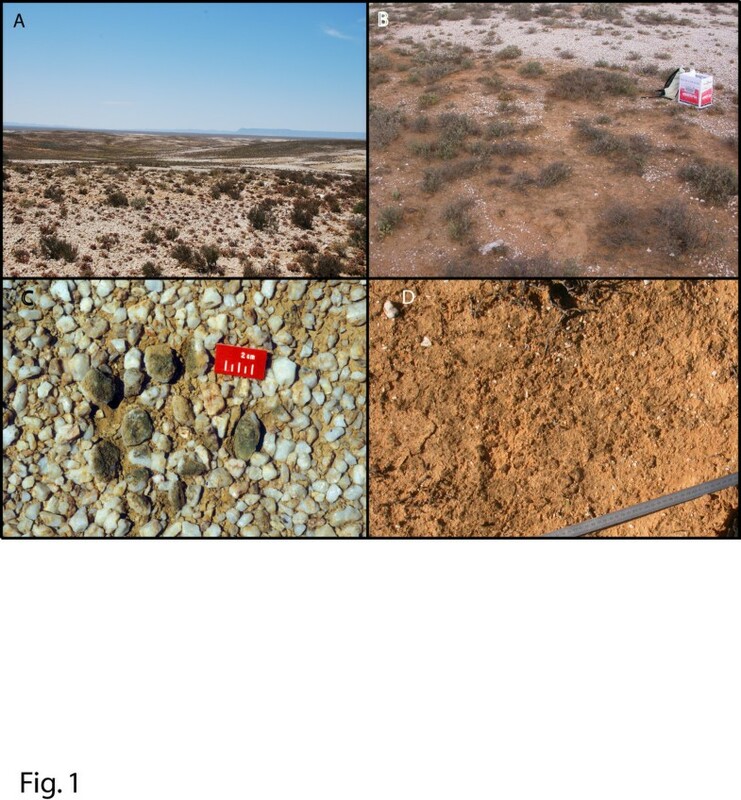 The images with the vascular plants were processed in the same manner and their percentage subtracted from the total pixel number per image, yielding the percentages of quartz pebbles and bare soil. In order to validate this digital method, three 25 × 25 cm areas of one sampling image were printed in color, and on each print, two 5 × 5 cm areas were randomly covered with transparent scale paper. On an illuminated screen, the edges of the quartz pebbles were traced with a pen onto the 5 × 5 cm scale papers, which were then enlarged and the quartz pebble pixels were counted. A comparison of the two methods revealed a maximum difference of 3.8%. Generally, only images that were taken before 4 p.m. could be included in the analysis, as shadows in the image distorted the results in those taken later. Images with shrubs were also excluded from the analysis since it was not possible to mask them out in a detailed manner. Consequently, ten 1 m2 plots could be used for the quartz pebble density analysis. The meso- and microclimate weather station was installed at 31.275°S, 18.598°E, (height 196.5 m a.s.l. ), adjacent to the northern edge of the BIOTA observatory Goedehoop (Observatory No. 26), between an area whose soil surface is totally covered by quartz stones (quartz field) and an area whose soil surface is either bare or covered by a biological soil crust. A number of Argyroderma pearsonii (N.E. Brown) Schwantes (Aizoaceae) plants grow in the studied quartz field, with numerous other plant species, all dwarf in habit, occurring in soil without a quartz stone cover adjacent to the quartz field. At the weather station the following mesoclimatic parameters were assessed: air temperature and air humidity at a height of 100 cm, protected from direct insolation by an inhouse-built radiation shield; precipitation (Davis Rain Collector II, Davis Instruments, Hayward, CA, USA); and ambient photosynthetically active radiation (PAR; LI-190, Li-COR, Lincoln, NE, USA). Microclimatic thermal conditions within the quartz field were determined through the placement of one small thermistor (NTC, close tolerance R/T curve matched thermistors) per location set out below (Table 1). Temperature changes within a quartz stone were determined by placing a thermistor snugly within a 5 mm deep hole drilled into the stone. The opening of the hole was sealed off with Pratley® Quickset Putty. A light sensor (G1116, Hamamatsu, Hamamatsu City, Japan) was installed under each of two quartz stones (length × width × height: stone 1: 35 × 28 × 10 mm; stone 2: 26 × 20 × 9 mm). Both stones were colonized by hypolithic cyanobacteria, thus representative of the prevailing hypolithic habitat. The organisms were then removed from the lower portion of the stones, and sensors were glued onto the undersides of these stones to measure the amount of light reaching the hypolithically growing organisms. Unfortunately, one sensor degraded after 6 months of measurements (due to muddy water leaking into the sensor on October 21, 2005). The second sensor remained intact and stable for the whole measuring time. The potential condensation time on the surface of quartz stones and on the soil surface was estimated for the time span from May 13 to October 19, 2005. Calculations were based on a rule of thumb for calculating the saturating vapor pressure, the so-called Magnus equation (eq. 3). The vapor pressure is defined as the product of air humidity and saturating vapor pressure (eq. 4). The dew point temperature can thus be calculated from the relative air humidity and the present temperature (eq. 5). Potential condensation conditions occurred if the quartz pebble surface temperature or soil crust surface temperature fell below this dew point temperature. The latter two sets of parameters were not used, since temperatures always remained above 0°C. In a first approach, the total duration of potential condensation conditions within the hypolithic and the soil-inhabiting crust habitats was calculated. In a second approach, only condensation conditions at least 1 h after the last precipitation event were considered. These data were then used to calculate the number of nights (from dawn to dusk) when condensation conditions occurred. Soil moisture was measured with two humidity sensors (ECH2O EC-10, Decagon Devices, Pullman, WA, USA) at a depth of 30 mm within the soil. One sensor was installed below a soil crust surface, and the second one was placed below a quartz layer with hypolithically growing cyanobacteria. Signals from all sensors were recorded every half hour by an in-house-built data logger from September 23, 2004 through September 7, 2006. Within the Knersvlakte, Chroococcidiopsis, Leptolyngbya, Lyngbya, Microcoleus, Nostoc, Oscillatoria, Phormidium, Pseudanabaena, Pseudophormidium, Schizothrix, Scytonema, Tolypothrix, and Trichocoleus were found to be the dominant cyanobacterial genera. The genus Chroococcidiopsis was observed to occur exclusively in the hypolithic environment, whereas Microcoleus and Nostoc were mainly found in soil-inhabiting crust samples. Within the soil-inhabiting crust and hypolithic habitat, nearly identical biomass values were present with Chla contents of 86.1 mg Chla/m2 (SD = 37.8; n = 5) and 87.7 mg Chla/m2 (SD = 38.8; n = 16), respectively. Chla+b contents were about 2/3 larger at 133.7 mg Chla+b/m2 (SD = 59.9; n = 5) in soil crusts and 136.2 mg Chla+b/m2 (SD = 52.4; n = 16) in hypolithic crusts. There were no significant differences in the Chl values between the two habitats. Within the quartz fields of Goedehoop, on average 46.8% (SD: 2.6, n = 10) of the soil surface was covered by quartz stones. Hypolithic communities were present beneath 69% of the sampled quartz stones (n = 682). Colonized quartz stones were significantly thicker than uncolonized ones (P < 0.001) with a mean thickness of 9.5 mm (median = 8.8 mm, SD = 4.2, n = 363) compared to 5.7 mm (median = 5.3 mm, SD = 2.5, n = 319) for uncolonized pebbles. The largest number of colonized stones had a thickness of 9 mm (Figure 2A), whereas the largest number of uncolonized pebbles were 6 mm thick. The colonized quartz stones were up to 29.8 mm thick; uncolonized stones only reached a maximum thickness of 18.3 mm. The mean thickness of all quartz stones from the sampled quartz field was 7.8 mm and ranged in thickness from 1.7 to 29.8 mm. 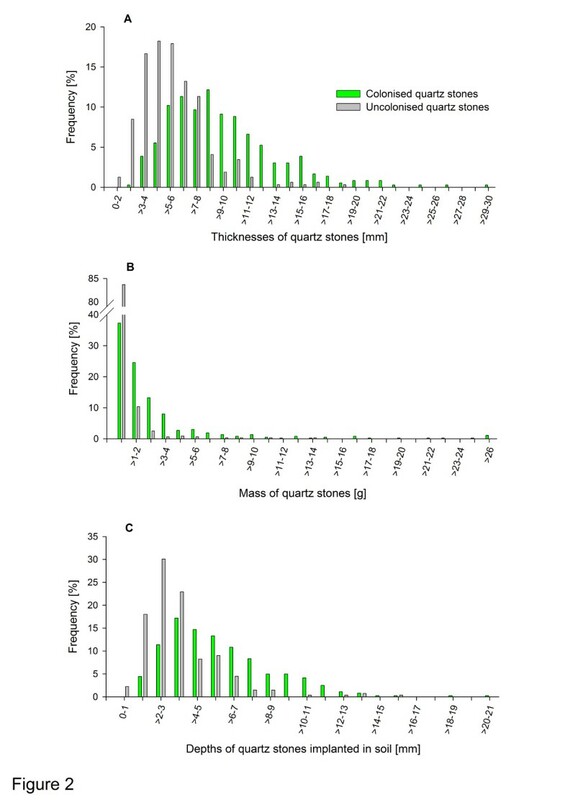 Frequency histograms of the thickness (A), mass (B) and depth embedded in the soil (C) of colonized and uncolonized quartz stones from a quartz field in the Knersvlakte, Western Cape, South Africa. The mean values of colonized and uncolonized quartz stones were significantly different (P < 0.001) for all three parameters. The mass of colonized quartz stones was significantly higher than that of uncolonized pebbles (P < 0.001), although the largest number of quartz stones with hypolithic growth had a mass ranging from more than 0.08 to 1.0 g (Figure 2B). Hypolithic communities occurred underneath quartz stones with a mass of up to 138.6 g, whereas the maximum mass of uncolonized stones was 13.4 g. The mean mass of colonized quartz stones from the sampled quartz field was 3.4 g (median = 1.5 g, SD = 8.8, n = 363), that of uncolonized quartz pebbles was 0.7 g (median = 0.4 g, SD = 1.3, n = 319). Colonized quartz stones were embedded significantly deeper in the soil than uncolonized quartz stones (P < 0.001) with a mean depth of 5.8 mm (median = 5.2 mm, SD = 3.0, n = 358) for colonized and 3.5 mm (median = 3.0 mm, SD = 2.1, n = 268) for uncolonized quartz stones. The colonized quartz stones reached up to a maximum depth of 20.1 mm within the soil, whereas uncolonized pebbles were embedded up to 15.9 mm (Figure 2C). The largest numbers of both colonized and uncolonized quartz stones were embedded 4 mm into the soil, ranging from a minimum of 0.4 mm to a maximum of 20.1 mm. 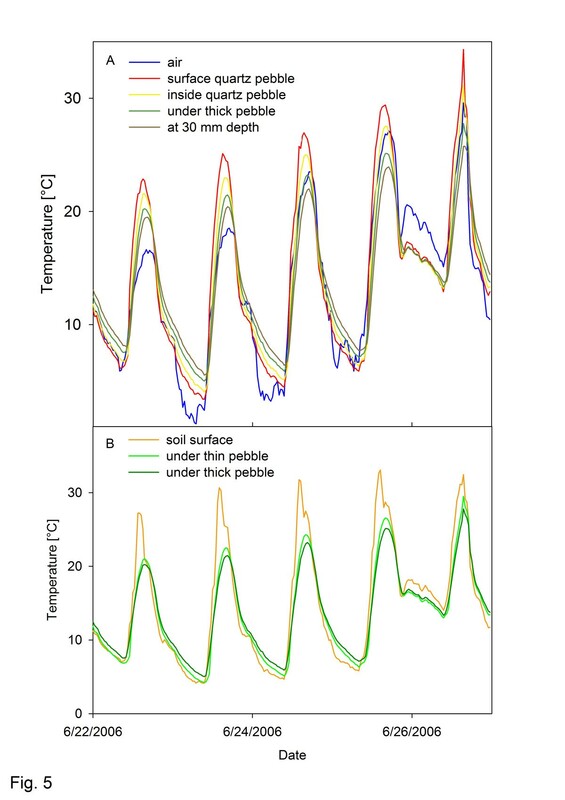 The mesoclimatic characteristics at the Knersvlakte site from September 1, 2005 to August 31, 2006 revealed a typical southern hemispherical climate with the highest daily mean temperature (32.3°C) being reached on February 1 and the lowest (9.2°C) on July 22 (Figure 3). The maximum air temperature recorded during that year was 44.8°C (February 1); the absolute minimum of −1.2°C was measured on June 6. Highest light intensities were measured during the summer months from November through February (Figure 3) with maximum light intensities of 2,251 μmol PAR m-2 s-1 being recorded on February 7; lowest values were recorded from June through July with the lowest daily maximum (433 μmol PAR m-2 s-1) occurring on August 24. The total amount of precipitation was 151.8 mm with the highest monthly precipitation amounts in May (65.2 mm), June (20.2 mm), July (12.8 mm), and August (21.4 mm), and the lowest amounts during summer in November (2 mm) and December (0.2 mm; Figure 3). There were no months without any rain during that year. Mesoclimatic conditions in the Knersvlakte, Western Cape, South Africa. Daily light intensity maxima, daily mean air temperatures, and daily amounts of precipitation, from September 1, 2005 to August 31, 2006. Microclimate sensors were installed in various locations to explore the microclimatic conditions within the soil-inhabiting crust and hypolithic habitat. Temperature conditions experienced by soil-inhabiting and hypolithically growing BSC were analyzed over the course of 1 year from September 1, 2005 to August 31, 2006. 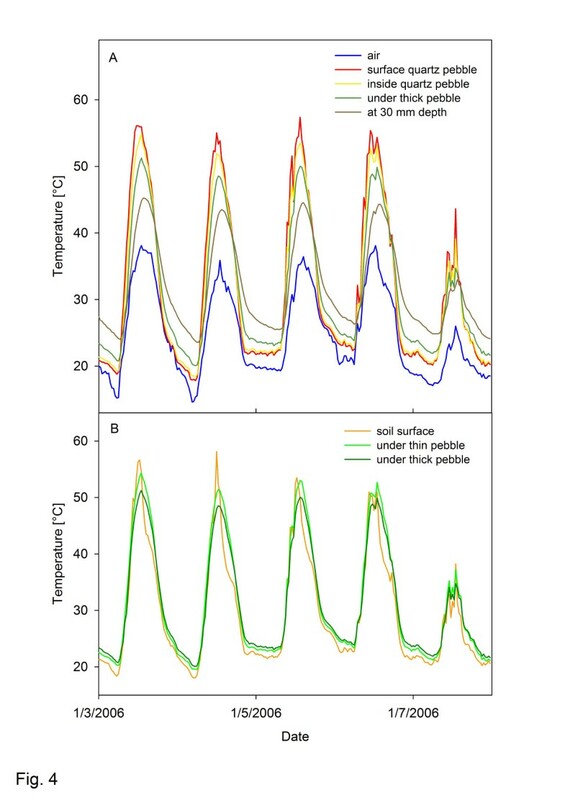 Temperatures on the surface of quartz stones (Figure 4A) and at the soil surface (Figure 4B) were highest during the day and lowest at night during most summer days. Temperature conditions within a quartz stone, under thin and thick quartz stones, and at a depth of 30 mm underneath the quartz field were increasingly moderated by the insulating effect of stone and soil. Air temperatures were almost always lower than soil/quartz temperatures, except for a few short events, as in the late evening of January 3, 2006 between 10:30 and 11:00 p.m. (quartz surface temperature higher than air temperature; Figure 4A). Summer temperatures measured at different locations during a characteristic time span, January 3–7, 2006. (A) Temperatures measured at a height of 1.80 m (ambient air temperature), at the quartz pebble surface, inside a quartz pebble, under a thick quartz pebble, and at a depth of 30 mm underneath a quartz field. (B) Temperatures measured at the surface of epigaeic soil crusts and under a thin and a thick quartz pebble. For dimensions of quartz pebbles, see Table 1. During winter, the same insulating effect of stone and soil was present (Figure 5). The differences between air and soil/quartz pebble temperatures, however, were far less extreme. 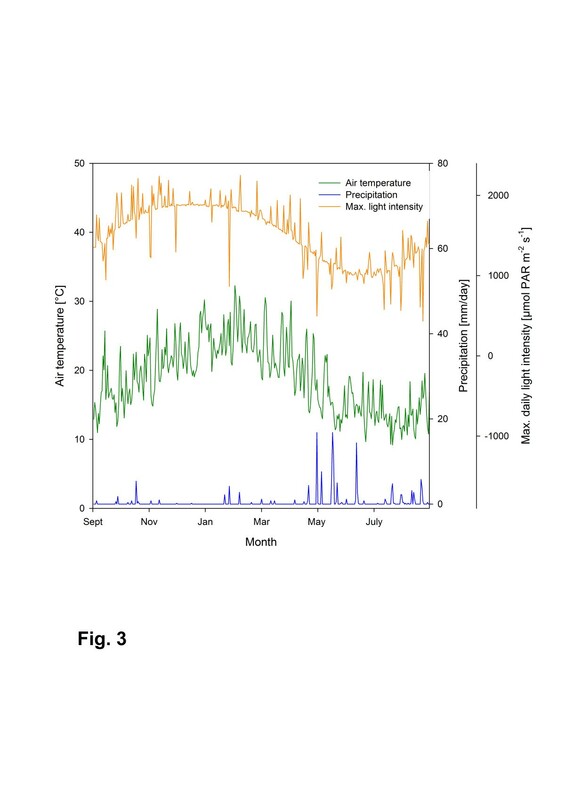 During early morning and late evening hours, air temperatures were frequently higher than soil/quartz pebble temperatures and sometimes they were even higher during the day and night (e.g., June 24–26, 2006, Figure 5). Over the course of the whole year, highest daily maxima and lowest daily minima were reached at the soil surface and the quartz stone surface (Table 2). Thus, the highest daily amplitudes of 48.1 and 47.5 K were also reached at the quartz stone surface and soil surface, respectively, whereas under the thin and thick quartz stones, amplitudes of only 39.4 and 36.0 K were recorded, respectively (Table 2). Winter temperatures measured at different locations during a characteristic time span, June 22–26, 2006. (A) Temperatures measured at a height of 1.80 m (ambient air temperature), at the quartz pebble surface, inside a quartz pebble, under a thick quartz pebble, and at a depth of 30 mm underneath a quartz field. (B) Temperatures measured at the surface of epigaeic soil crusts and under a thin and a thick quartz pebble. For dimensions of quartz pebbles, see Table 1. Temperatures on the bottom of the thin and thick quartz stones were up to 4.0 and 4.2 K higher than at the quartz stone surface (on November 6, 2005, 4:30 p.m. and September 20, 2005, 6:30 p.m., respectively) and up to 15.4 and 15.7 K lower (on October 2, 2005, 10:00 a.m. and October 14, 2005, 11:00 a.m., respectively). Over the course of the year, temperatures under the thin and thick stones were higher than those at the quartz surface on 220.8 and 224.6 days, equal for 7.8 and 3.4 days, and lower for 136.2 and 136.8 days, respectively. Over the whole year, the mean temperature values under the thin and thick quartz stones were 0.3 and 0.5 K lower, respectively. During the summer months (December through February) mean temperatures under the thin and thick stones were 0.2 and 0.6 K lower than at the quartz surface, whereas during winter months, temperature differences were 0.5 and 0.4 K lower temperatures, respectively. Ambient light intensities reached values up to 2,273 μmol PAR m-2 s-1 during summer, whereas under the quartz pebbles the maximum light intensity was only 586 μmol PAR m-2 s-1. The course of light intensity during daylight closely followed the ambient light (Figure 6), reaching 15–30% of the ambient light intensity with higher percentages in the afternoon hours. 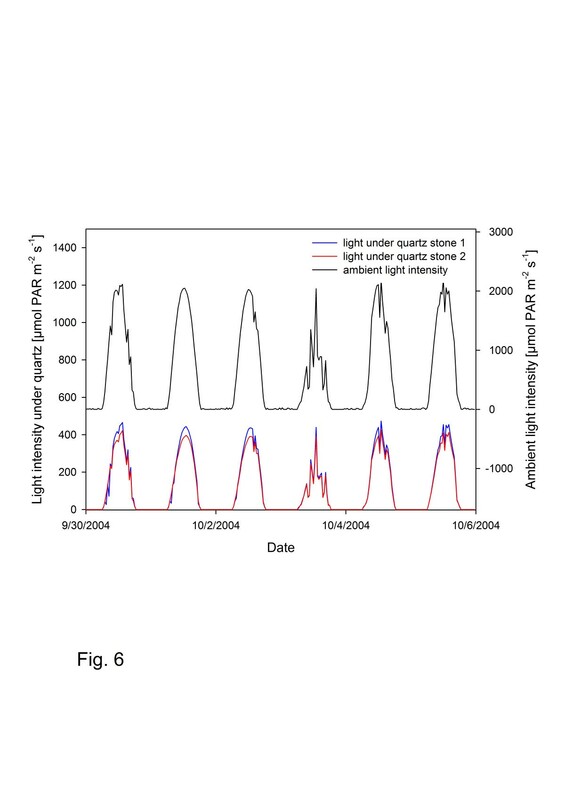 Light intensity measured underneath two translucent quartz stones as compared to the ambient light intensity from September 30–October 5, 2004. Fluctuations of the ambient light intensity are closely resembled by light intensities within the hypolithic habitat. Potential condensation conditions occurred almost exclusively from the late evening until the early morning hours (from dawn to dusk). During the time span from May 13 until October 19, 2005, potential water condensation occurred on the quartz surface during 98 of the 160 nights (61%), whereas on the soil surface potential condensation conditions were only present on 74 nights (46%). On some nights, these conditions coincided with rain events. Considering only nights without rain at least 1 h prior to or during condensation conditions, there were still 80 nights (50%) with condensation conditions on quartz, but only 54 nights (34%) with these conditions on the soil crust surface. On an hourly basis, potential condensation conditions on the surface of the quartz pebbles occurred for 538 h in total, corresponding to 14.0% of the time, whereas on the soil surface comparable conditions occurred for only 355 h or 9.2% of the total time. When condensation conditions within 1 h of the last rain event were eliminated, there were still 498 h (corresponding to 13.0% of the time) on quartz pebbles and 316 h (8.2%) on the soil crust surface. Soil moisture contents were analyzed for a time span from September 1, 2005 to August 31, 2006. During that year, soil moisture at a depth of 30 mm revealed large differences, depending on whether the sensor was placed below the surface of a soil-inhabiting crust or a hypolithic crust (Figure 7). The soil moisture below the soil-inhabiting crust was almost always close to zero from October through April, and only larger rain events, as on October 17, 2005 (5.4 mm) and January 26, 2006 (3.2 mm) led to a short-term increase in soil moisture. Under the quartz surface, soil moisture always remained somewhat higher and the “period of dry soil” only lasted for approximately 6 weeks from the beginning of December to January 21. Smaller rain events during the dry season, as on January 21 (2 mm), February 6 (2.6 mm), and March 2 (1.2 mm), led to much larger soil moisture values under the quartz surface, which lasted for 81, 124, and 106 h, respectively, whereas under the soil crust, such small events only led to a short-term increase in soil moisture or caused no increase at all. Soil moisture at a depth of 30 mm measured below biological soil crust and below a quartz layer from September 2005 through July 2006. Precipitation values are shown for data interpretation. An intense rain event at the end of the dry season on May 1 (16.8 mm) caused a substantial increase in soil moisture below both crust types. The water content below the soil-inhabiting crust was still lower than that under the quartz layer and it decreased much quicker. Soil moisture under the quartz layer remained high with values above 0.3 m3/m3 almost continuously from April 28 to August 31. Evaluation of the two biological soil crust habitats—soil-inhabiting and hypolithic crusts—revealed obvious microclimatic differences, i.e., moderated temperature variation, lower light intensities, and wetter soil conditions within the latter habitat. Nevertheless, almost identical biomass values were measured in both habitats, suggesting that the two habitats are occupied by stable communities of photoautotrophic organisms. In addition to a set of widely occurring genera, we observed Chroococcidiopsis to be restricted to the hypolithic habitat, whereas Microcoleus and Nostoc occurred almost exclusively in the soil habitat. Chlorophyll values of 86.1 and 87.7 mg Chla/m2 and 133.7 and 136.2 mg Chla+b/m2 measured in the soil and hypolithic habitat, respectively, are well within the range reported by Broady (1981), who observed Chla values of 64 mg/m2 (SD = 40) for sublithic communities within moist mineral soil and 120 mg/m2 (SD = 60) within dry mineral soil in Antarctica. Büdel et al. (2009), who studied biological soil crusts along a transect in southern Africa, measured very similar values in late successional lichen- and bryophyte-dominated crusts with values of 86.3 mg Chla/m2 and 135.8 mg Chla+b/m2, whereas for initial, light cyanobacterial crusts (31.8 mg Chla/m2 and 49.3 mg Chla+b/m2) and well-developed cyanobacterial crusts (67.9 mg Chla/m2 and 112.5 mg Chla+b/m2) lower biomass values were reported. On a biome-basis, higher biomass values were only reached within the Namib Desert (141.5 mg Chla/m2 and 230.1 mg Chla+b/m2), whereas in the Dry Forest, Dry Savanna, Nama Karoo, and Kalahari, values were clearly lower (Büdel et al. 2009). As a first assumption, one might expect higher biomass values in the hypolithic environment, and we could imagine two potential causes for our equal values. First, the hypolithic habitat is limited in space, i.e., all favorable stones are fully colonized, and biomass could reach higher values if more suitable hypolithic habitat was available (e.g., at higher quartz stone density). Second, when activated by water, the soil-inhabiting crusts reach a far higher net photosynthesis rate due to the higher light intensities at the soil surface. Unfortunately, CO2 gas exchange measurements do not serve as a reliable method here, since bare Knersvlakte soils have been observed to release CO2. An estimation of biomass values by means of chlorophyll values has to be considered with care, since chlorophyll contents of autotrophic organisms are known to vary, e.g., with changing nutrient status of the organisms (Kruskopf and Flynn 2006). Nevertheless, chlorophyll determination represents the most appropriate method to assess the biomass of the photosynthetically active parts of BSC. Since nutrient distributions within our study area are considered to be fairly homogeneous, this method is estimated to be well suited to meet our task. For the coverage of quartz stones, almost identical values were determined by Vogel (1955), who found 43% versus 46% determined by us. The frequency of hypolithic photoautotrophs has been determined in a variety of hot and cold deserts to range from 0 to 100% (Table 3). Annual precipitation seems to be one factor influencing the frequency of hypoliths and rock type also has an impact, as Berner and Evenari (1978) showed with different colonization frequencies on light and dark flint in the Negev Desert. On the mainland and islands of Baja California, frequency of hypoliths on quartz pebbles reached about half the values observed by us at about half the amount of annual precipitation (Heckman et al. 2006). In cold deserts, large ranges in the colonization rates were observed depending on the impact of fog (Azúa-Bustos et al. 2011) and snowmelt (Pointing et al. 2009) in addition to the precipitation influence (Azúa-Bustos et al. 2011). With decreasing precipitation and fog, frequency approached zero (Warren-Rhodes et al. 2006). Extraordinarily high frequencies of 95 and 94% were documented by Cockell and Stokes (2006) on Devon and Cornwallis Island, respectively. Schlesinger et al. (2003) even reported that 100% of all quartz pebbles in the southern Mojave Desert are colonized by photoautotrophs, despite the fact that the annual precipitation rate is even lower than in our study area. It also is striking that the smallest pebbles they found had a thickness of 5 mm and were all colonized, whereas we found only 26% of the pebbles between 4 and 5 mm to be colonized by cyanobacteria. Additional information is given on the colonized rock type, the annual precipitation within the region (as far as available), and the reference of the data. We observed the colonized stones to be significantly thicker (mean thickness: 9.5 mm) than uncolonized ones (mean thickness: 5.7 mm), which is in accordance with Azúa-Bustos et al. (2011), who also found increasing colonization rates with increasing quartz rock size. In contrast, Berner and Evenari (1978) reported larger mean stone thickness values for uncolonized light and dark flint stones (16–20 mm) as compared to colonized ones (11–15 mm). Our data revealed colonized quartz stones to be significantly heavier (mean value: 3.4 g) than uncolonized ones (mean value: 0.7 g). Despite the fact that the mass of stones is an essential factor influencing stability of the hypolithic habitat, no comparable data could be found in the literature. Unfortunately, our microclimate sensors were not installed in sufficient numbers to allow for statistical analyses. Nevertheless, we believe that our data may serve as an important resource, as we are the first to describe the long-term microclimatic conditions within the soil crust and hypolithic habitat in the Knersvlakte. Our measurements clearly revealed that temperature conditions under the quartz stones were less extreme compared to the quartz stone and soil surface. This finding was also reported by Azúa-Bustos et al. (2011) for the Atacama Desert and is generally expected for both hot and cold deserts (Chan et al. 2012). However, Schlesinger et al. (2003) measured larger temperature amplitudes and higher temperature maxima under the quartz stones as compared to the stone surface. They describe this phenomenon, which is puzzling to us and contradictory to all the other data, as a modest greenhouse effect under the quartz stones. Absolute temperatures measured by us in the hypolithic environment ranged from 4.2 to 59.7°C, which is surprisingly similar to the values observed by Berner and Evenari (1978) in the Negev Desert (about 2 to 50°C) and by Tracy et al. (2010) in northern Australia (about 9 to 60°C). We observed light intensities under the quartz rocks to be clearly lower, but still reaching about 15–30% of the ambient light intensities, which were closely tracked. This is somewhat higher than the measurements of Vogel (1955), who found a transmission of about 9.4% of the ambient light at a stone thickness of 10 mm. Our higher values may be caused by a somewhat shallower embedding of the quartz pebbles after installation of the light sensors as compared to their original position in the soil. On the other hand, Vogel (1955) described his lab measurements as an estimation that did not account for scattered light coming in from the sides, which may again increase the amount of incoming light. In contrast to that, Berner and Evenari (1978) measured only 0.005% of the incident light at a depth of 10 mm, Schlesinger et al. (2003) observed 2.8% of the incident light at a depth of 12 mm (wavelength: 680 nm), and Broady (1981) found that 2.7% of the incident light reached the bottom of a 13 mm thick stone. A major drawback of all these measurements (including ours) is that only light descending from the upper part of the rock was measured. Due to light scattering and reflectance within the stone and the surrounding soil layer, light most probably also reaches the organisms from the sides and even from underneath. In order to measure this, especially adapted scalar irradiance sensors have to be applied (Kühl et al. 1994). We calculated condensation to occur much more frequently on the quartz stone surface as compared to the soil surface (538 vs. 355 h corresponding to 14.0 vs. 9.2% of the time from May 13 to October 19, 2005). If the influence of precipitation, which may cool down the quartz or soil surface, was excluded, there were still 498 vs. 316 h of condensation conditions. Condensation conditions without rain influence were observed during 50% of the nights on quartz pebble surfaces, but only 34% of the nights on soil crust surfaces. This difference is most probably caused by the higher heat transfer rates of quartz stones as compared to the soil surface, causing the quartz pebbles to cool down more quickly. The condensed water trickles along the quartz stone sides and infiltrates deeper into the soil, as Vogel (1955) observed in an experimental approach. During drying he found that, due to the blocked evaporation, the soil under the stone remained wet for a longer time. This perfectly agrees with our measurements of far higher and also more balanced humidity values under the quartz field as compared to the soil-inhabiting crust. The lower maximum soil moisture may also be caused by a lower pore space of soil below soil-inhabiting crusts as compared to hypolithic crusts. Higher moisture contents under the quartz stones as compared to the surrounding soil were also found by Smith et al. (2000), and in the absence of rain, Azúa-Bustos et al. (2011) observed humidity values above 90% in the early morning hours. Our measurements revealed that, in spite of large microclimatic differences, almost identical biomass values were reached by the soil-inhabiting and hypolithic communities. Whereas the soil habitat was characterized by more extreme temperatures, short infrequent precipitation-, fog-, and dewfall events, and high light intensities, the temperatures in the hypolithic environment were more balanced and water conditions were much more favorable, while light intensities were clearly lower. Microscopical studies revealed that Chroococcidiopsis only occurred in the hypolithic habitat, whereas Microcoleus and Nostoc were almost exclusively observed in the soil habitat. In further studies it would be interesting to investigate the physiological preferences, adaptation, and acclimatization of these communities. Various forms of assistance from the Universities of Limpopo (South Africa) and Kaiserslautern (Germany) are gratefully acknowledged. We would like to thank Douw Venter, Rudi Wetterman, and Martin Potgieter (University of Limpopo) for their help during the design and installation of the climate stations. Research in the Knersvlakte, South Africa, was conducted with Northern Cape research permits (No. 10/2005, ODB 052/2006) and the appending export permits. This project was financed by the German Ministry for Education and Research (BmBF) in the framework of BIOTA South (promotion number 01 LC 0024A). BW, KD, SD, DW, and BB designed the project; DW designed the climate station setup; SD and BB conducted taxonomic determinations; BW, DW, KD, HR, and BB established the climate station in the field; BW, DW, KD and BB evaluated quartz stone colonization; DW KD and BW analyzed the field data; and DW and BW wrote the manuscript. All authors carefully read and approved the final manuscript.